To sign up as an Exhibitor for the 2019 Annual Meeting, please download and complete the Exhibitor Contract. Fax the form with credit card information to (414) 276-3349 or mail to AAEA at 555 E. Wells St., Suite 1100, Milwaukee, WI 53202 with credit card information or check. Exhibitors receive a booth in a high traffic area, along with one free meeting registration. Exhibitors have the opportunity to interact with attendees throughout the entire meeting. Exhibitors are invited to participate in all non-ticketed events at the Annual Meeting. 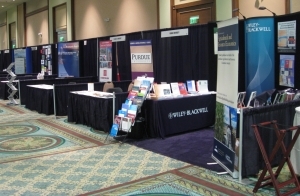 The 2019 Annual Meeting will provide exhibitors with exposure to attendees who work in academic departments, government agencies, NGOs, and in the private sector in the fields of agricultural and applied economics. Over 1,400 participants are expected to attend the 2019 Annual Meeting. Meeting attendees have the chance to attend a large number of concurrent sessions, plenary sessions featuring invited speakers, and banquet and luncheon forums. AAEA is committed to providing Exhibitors with a location best suited to attract the interest of our attendees. Exhibit Booth Cancellation Policy: Any cancellations must be made in writing to AAEA (by mail to the business office, fax to (414) 276-3349, or email to mannen@aaea.org). Cancellations received before May 30, 2019 will be refunded less a $100 processing fee. No refunds will be made for cancellations received after May 30, 2019.